The Mercer University Professional Master of Business Administration for Innovation program at the Stetson School of Business is a 16-month program that enables business professionals to maintain and advance their careers. The PMBA is a fully integrated program designed for the experienced business professional who wants to advance to the next leadership level in today’s corporate world, or master the skills to become an entrepreneurial leader. 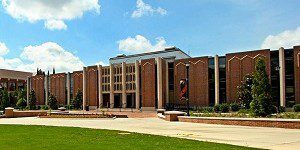 The Mercer University Professional MBA program is comprised of four “thematic modules.” These modules each begin with a retreat where students will spend time immersing themselves in learning about a particular topic. In the program’s “Best Practices Field Residency,” students travel to a business hub (for example New York City) to gain first-hand experience. Students also have the opportunity to meet with successful company executives as part of the PMBA program. The PMBA program requires that students have work experience that is relevant to their course of study, though no minimum amount of experience is specified. Therefore students come into the program with varying levels of work experience, and the nature of the program attracts students from different age ranges and backgrounds. Students maintain employment throughout the duration of the program. Tuition for the entire Mercer University Professional MBA program is $42,500. This tuition includes air travel and lodging during the field residency as well as some lodging and meals during retreats, access to campus facilities, classroom materials and technical support. Accepted students must pay a $100 non-refundable deposit to keep their spot, and this will be applied to the first semester’s tuition. The Mercer University Office of Student Financial Planning is available to assist students in learning about their federal loan tuition assistance. Applicants to the Professional MBA for Innovation program must have completed a four-year degree or its equivalent for admissions, though is does not have to be in business. The applicant must first fill out the application form, send an official copy of transcripts from all colleges and universities attended, submit a copy of their résumé, two letters of recommendation, a 250-500 word personal statement and complete a faculty interview. Applicants will also need to complete a quantitative and written test. A nonrefundable $50 application fee is also required. Applicants who are not native to the U.S., as well as U.S. Citizens who graduated from a university outside of the U.S., will need to submit any education credentials to an independent evaluation agency, which will help determine what the U.S. equivalent is to their international credits. Non-native applicants are also required to take the TOEFL or IELTS if their primary language is not English. This requirement is waived for individuals who have taken college-level English composition and and earned a grade of “C” or higher, or for those who have already attended another college or university in the U.S. Applications submitted after January 15 are admitted on a rolling basis.